A unique multi-view feature centralises the data, interpretations and analysis for a complete well journey from prognosis to completion. Load real-time data and display instantly, generate calculations on-the-fly, produce auto-reports and perform 1-click export of data for corporate data stores. Bespoke multi-view templates provide a company standard for log presentation and supports the auto-creation of regulator approved formats. Easy to learn in just one day. Concentrate on the log presentation and build ‘data’ in the background. Leverage the data already in your log to generate daily reports and provide data to populate corporate data stores. GEO enables the creation of a comprehensive range of log formats representing the lifecycle of a well, and allows the team to monitor, interpret and analyse the information with easy to access tools and techniques. This information can be shared efficiently from the wellsite to the operations base. It also serves to dramatically reduce the time and effort required to produce final well logs for submission to regulators and partners. 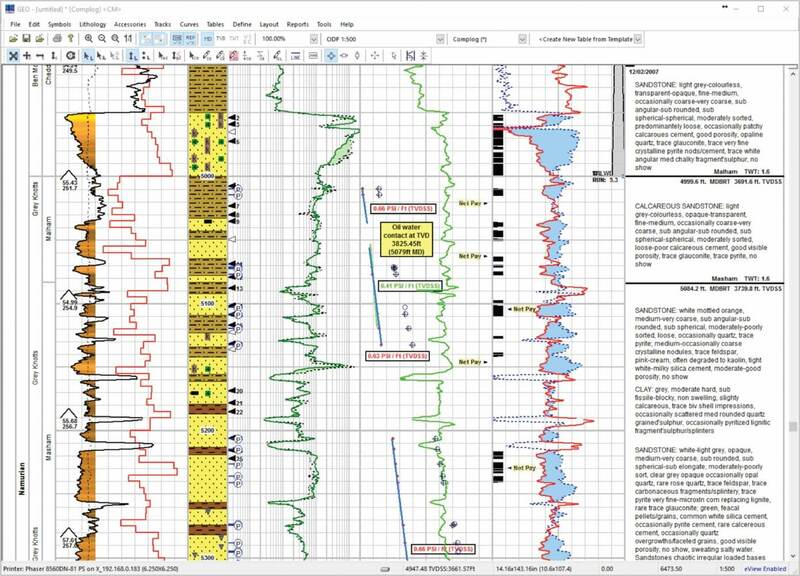 Add to this the simultaneous creation of supporting logs such as Gas Analysis, Quick-look Water Saturation and Pore Pressure charts and GEO will ensure users can leverage all the information in the most effective way.